Everyone comes to a book with a set of expectations, whether it is one of hope or longing or something totally different. So when we begin reading, we are doing so looking for something. Whether it is to be entertained, to learn or a host of other possibilities, we are actively choosing to open the book to start the journey. I know that when I approached Sinner and the Sea, it was with hopes of a new story, something fresh not anything rehashed. I can say that I wasn’t disappointed at all. While this is purely a work of fiction, though based on a historical person and event, we want to remember that this is not the Bible. It is a tale that spurs the imagination to a time long since past. 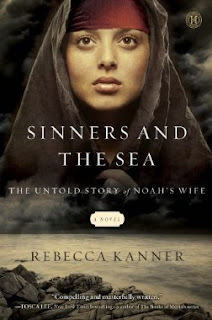 The subtitle is “The Untold Story of Noah’s Wife”, which is part of what drew me to read through to the end. We can only imagine what happened in antiquity, which is what opens authors as well as readers minds to the plethora of stories. I cannot remember reading a novel as unique as this one with the main character not being Noah, but his wife. Most published writings tend to focus on people or events well remembered. Here is writing that swells with emotion at times while other times it ebbs to a quiet moment almost like giving the reader pause to consider what has occurred before. Sinner and the Sea doesn’t withhold the raw fervor of the times, people living moment by moment and how that may have occurred. Also, the author paints the wickedness which wrought God’s wrath in a balancing way that paints the images in the reader’s mind without being overly gruesome. The narrative is told through the eyes of Noah’s wife, what she is seeing and thinking along with feeling. Again, remind yourself as you read this excellent work of fiction, it is fiction not fact. For factual content remember the Bible is where to begin, and then to expand your understanding of the Biblical text, read trustworthy extraneous sources. I highly recommend taking time to read Sinners and the Sea, using it perhaps as a conversational piece with others who might not be familiar with Scripture or use it for your own personal learning. Then, go back to the Bible and see what God is speaking to your heart about His heart. While I was reading, I again was reminded of how God is a judge who loves us so much that He sent Jesus. The rainbow that people want to use for other meanings is meant for one and one alone; God’s promise never to flood the earth again.